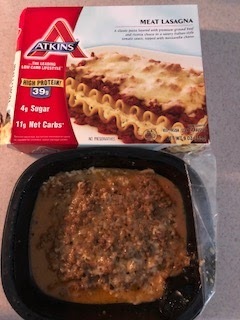 My husband microwaved a meat lasagna yesterday and when he opened up the cooked product to eat it, he showed it to me and it did not look anything like the picture on the box. I feel I was mislead by the picture on the box and he was very dissatisfied with the taste, texture and visual of the product. I have purchased several Atkins frozen breakfast products, and pizza which he really enjoyed. A few weeks later I received a response from Atkins Nutritionals. They included several coupons for Atkins products including a free frozen meal. They also stated that my information would be sent to their marketing department for review. The take away here is that you should always contact the company directly when you find issue with their product. Stop wasting your money and speak up! Most companies make it very easy for you to contact them either through phone, email or social media accounts. Most companies want to make you happy and will likely refund or send you coupons in the mail. I once had an issue with 2 bags of frozen gluten free chicken from Perdue. The chicken strips were overcooked and burned. I emailed the company and they sent me a check in the mail to cover the cost of the two bags of chicken. I was so impressed with their response that we still use their products. Since then they have actually slightly changed the chicken and packaging.. win-win! Check out an easy way to get your groceries for only $14.99/month!